This Portuguese wine arrived in a mixed case from Laithwaites. 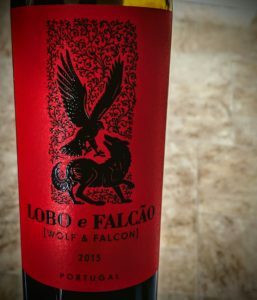 To make life easy for everyone, the makers not only call it Lobo e Falcao, they also put [Wolf and Falcon] underneath, with a picture of a wolf and, you guessed it, a falcon on the label. The falcon is a bit alarming, as it’s almost as big as the wolf. Having cleared that up, we followed on with a discussion about whether Radamel Falcao could have been a success in the English Premier League if he’d joined Manchester United during a more settled period, or not picked up his injury at Chelsea. Maybe if he’d gone to Manchester City things would have been different, but who knows. I got to see him play a couple of times, most enjoyably at Leicester City when they beat Manchester United 5-3, although Falcao was utterly anonymous (Di Maria did score a worldie, but United were no match for the mighty foxes). I digress, just a little, but that’s what wine is all about, enjoying and talking. This ’15 vintage was a rich deep red. It smells fruity and just a little forest-y, there’s some autumnal berries and smoky leaves and a little oaky spice. It’s dry, but the sweet fruit gives the impression of extra sweetness. The acidity is at the lower end of medium and the tannins are soft and smooth. With an alcohol level nudging towards high you can certainly feel it in your mouth and it is warming, bringing out the spiciness. The forest fruit flavour carries through well and holds its own against the alcohol, all in all giving quite some feeling of body. It fades away leaving you ready for another smooth mouthful quite quickly. At £9 retail and less in assorted mixed case options this is a good value choice for autumn evenings. It comes from the Lisbon area, if Lisbon is Iberia’s nose, this comes from well up the nostril. The romantic story behind the name and label is that it’s made in the vineyards that belonged to the Lobo family (that’s people called Lobo, not a family of wolf vignerons, sorry) and they used to care for the King’s falcons. When he dropped by to hunt with the falcons, he ay have enjoyed a glass of this wine, though not this vintage. Have to love the label!